If you are interested in joining a future program, please send me an email showing interest, and sign up (bottom of the page) for updates through newsletters. Look forward to seeing you in the wild! · Our wild is entirely interconnected with nature, and with each other as animals in that system. We are nature. We are meant to spend time to connect deeply and comfortably with the never-ending supply of creativity, the flow of cycles, to access the medical benefits* that are so readily available to us if we just give them our time, attention, and intention. Being in a group brings us support, we grow together, we mirror each other for deeper growth than we can experience alone. · I am an Ecotherapist, specializing in somatic, body based ecotherapy. · I have created a deep soul program to bring us into deep connection with nature, and each other, embodying our true nature as women. · Each part is based on a 5-part flow, inspired by the cycles in nature. · We will meet once a month on Sunday for 5 hours in the mountains over 4 months, in May we will go on an overnight camping trip together. As a group, we will decide the ‘wildness” level of our camping and backpacking trip. · I will bring you to my favorite places in the Blue Ridge Mountains. We will experience the forest moving from the letting go time of Fall, into the inward reflective time of Winter, and at different times of the day and night. Each location has special and different qualities, but each has privacy, and is wild and natural… just as you are!
. Level of hiking /camping /fitness and equipment: Our focus is on connection with nature rather than exercise. We walk slowly and support each other, but the trails can be rocky and weather can be rainy in the Spring. We sometimes cross shallow rivers on a warm day, or short steep climbs to a special view. You must feel comfortable hiking two and a half miles each way with an approximately 20 lb backpack for the overnight. Day trips are usually a mile or less with a small daypack. You will need a small backpack for the day trips, and you need to be willing to rent the correct equipment for the overnight if you do not own/borrow it. The max price for renting is $25 if you need all the basics, and I can advise where to rent it in Charlottesville. I provide a thorough list and we discuss the overnight trip in detail. You will be guided and supported. Clothing: “there is no bad weather, only bad clothing” :-) You will need good shoes that have a tread, and clothes appropriate to the weather so you’re comfy! I like to help women figure out what they need without purchasing anything if they don’t want to! · My personally developed materials such as…. How to use the 5 part flow with individual guidance and support in creating a nature practice to change your life, The levels of nature connection & understanding why intention is a practice, my core belief that falling in love with nature requires intention and practice in the same way as our the other relationships in our lives; how to be comfortable in the woods; a checklist of nature features to create your own personal sit spot; finding your edges and working with them; finding your personal style in nature; I will teach the new research in the health benefits of spending direct & regular time in nature. Empower yourself to hike and saunter and backpack and primitive camp. I know these skills and love to empower other women! Learn what to bring and where to go. Movement and Voice practices such as…. authentic movement with nature, sounding for healing and connection with humming and toning. · Ancient practices that bring out our primal nature such as… mandalas, making fires, drumming, getting muddy, yelling freely! · You will integrate the practices you learn into your daily life. You will create a deck of cards along the way of this journey, writing up and illustrating the practices that you have learned in our time together that match your character and lifestyle, and you begin to practice integrating them into your everyday life, supported and nurtured by our group along the way. Some groups create a pebble meditation sack and a living journal, supporting your personal practice beyond these few months. What will it be like? Can you give me an example? As a group, we begin with a simple ritual to cross a threshold into intention, committing to leaving our past and future behind and focusing on the present for our time together. You are led in a nature meditation, opening to the wisdom of the trees above your head, the earth below you. You hold dirt in your hands, you are led through a sensory experience connecting you to the trees, the earth, the leaves, the small animals around you. 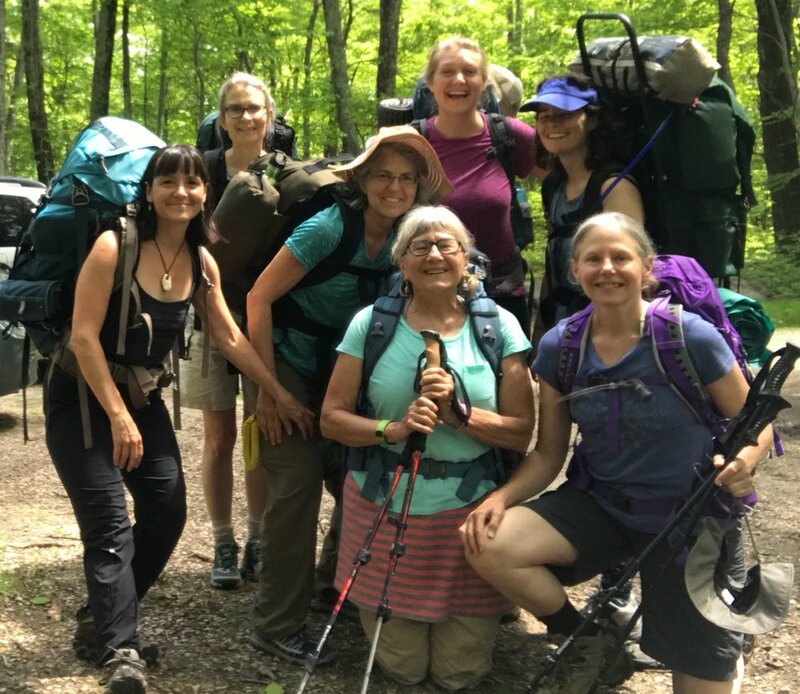 The group gathers and creates a circle of women, an intention set, a song sung, and we part paths to go on a solo medicine walk, together and alone. This intention brings you to an old tree. You have been practicing hugging, listening, being with trees, so you settle and lean in and listen and connect. Back in the circle each woman shares of the medicine she received on her walk. Each one has something to offer, to add to your experience. You share and are heard. The circle of women support each speaker with rattles and drums as she finishes sharing her story. We make a fire, moving like the flames, feeling the heat, noticing how much you can feel your whole body, wild in the woodlands. You add your nature object to a mossy rock we use as our woodland altar/meaningful centerpiece. During the last part, Appreciation, you choose to write a poem, make your nature as my ally card, and then watch the stars. I am very open to talking to you about the program. I want you to be sure it is a good match for you, and also for the group! Plan on all day gatherings February 17 (with a rainout date Feb 24), March 17 (with the rainout date March 24), April 21 (with the rainout date 28), Overnight May 11-12 (with the rainout date May 23-24). Times TBA. We want to experience the woods at different times of the day and evening, so we meet early some gatherings in the bright day, and later others, to see a sunset and have a night hike. This price of this program is for the entire program, not divided per session. The deposit is non refundable. You will be asked to sign a contract for full payment should you decide on the monthly payment plan. Cost without “earlybird” is $750. Early Bird Price $700 with a Non refundable deposit of $200 received by Jan 15th. Payment plan evenly divided Feb 1, March 1, April 1, May 1 by scheduled credit card or a complete set of postdated checks.